It has an input/output interface box, with 2 RJ45 female connectors, to connect to the nearer PDU and to extend the bus to the next sensor. IP PDU can have up to 8 sensors connected, regardless of its type, as the PDU detects the sensors and deliver its measured parameters to the PDU´s web interface / email system and SNMP. 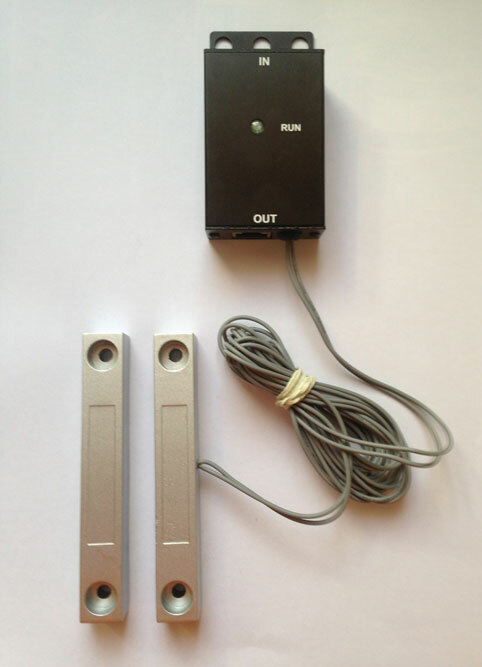 The sensor has an electro-magnet connected to the interface box, and a magnet that should be installed opposite, less than 10 cm. with door closed, so when door is opened it triggers the alarm. It is a direct alarm, as it is intrusion, so there are not control parameters; automatically triggers a silent alarm, which will be sent via eMail and SNMP.